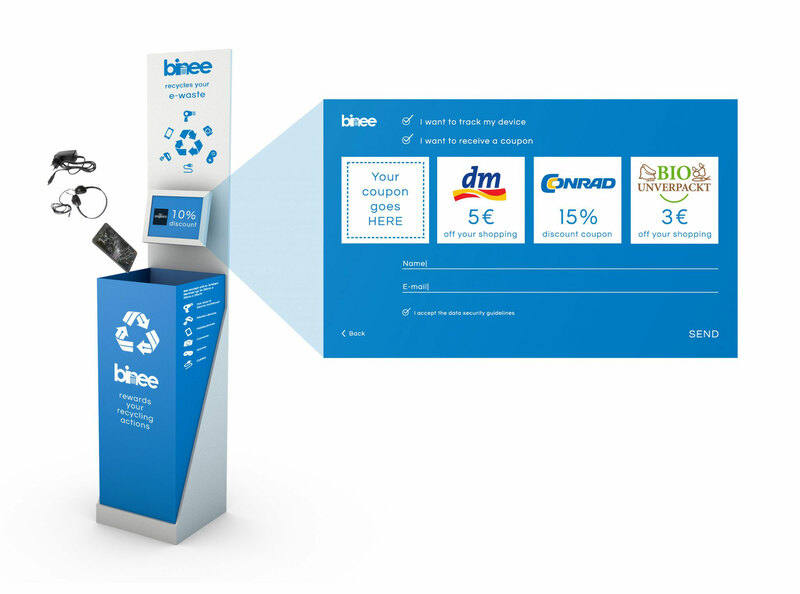 Binee is an ad-sponsored e-waste collection system. By motivating users to bring back old electronic devices it aims at increasing the collection rate and create transparency along the secondary value chain. To meet the requirements from the EU Commission to reach higher collection and recycling rates for WEEE and especially for small electronic devices, retailers and recyclers need to attract customers to bring back their old devices. Especially small devices contain considerable amounts of critical raw materials, like Co, Ga, Li, REE and Ta on their hard disc drive, displays, permanent magnets or batteries. In addition to long-term established take-back solutions for WEEE, Binee could increase the collection rate by using a customer-centric approach and increasing transparency along the value chain. This might complement existing recycling processes as well as deliver input streams to new recycling approaches developed by EIT RawMaterials partners.